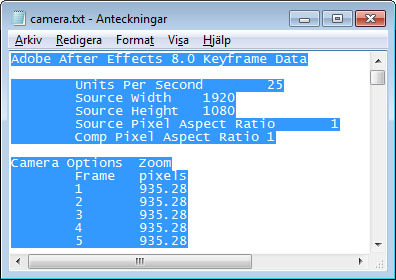 Here's a menu script that exports the camera movement to After Effects keyframe format. I've had problems (and long render times) with large images in AS pro so I wrote this to make my life easier. It gets the camera information between the in and out point of the project and gets the camera values from every frame, not just the key frames. This is done for maximum accuracy and it's like when you track a layer in After Effects. I haven't tried anything too advanced yet, but it seems to work. 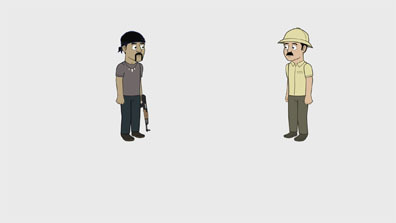 The left image is animated in AS, the right is a still frame in After Effects with imported camera motion. Let's say I want these two characters standing on piles of money with the camera moving. I render out the animation with the characters as PNG files (I want a transparent background) and export the camera movement to a text file. 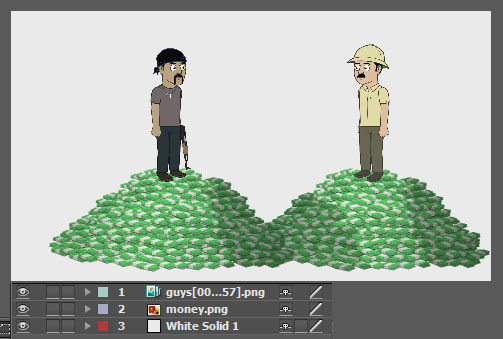 In After Effects I import the rendered frames and Import a high resolution image of the money (that I scale down appropriatley for the scene). But now I set the image layer to 3D (the layer with the guys should NOT be set to 3D as this layer already has the camera movement rendered). And then create a camera. I go to the text document with the camera movement (the one exported from AS) and copy the text inside. Of course you could add several other 3D layers and arrange them in 3D space and build an environment that way. You can also import Illustrator files in After Effects, just make sure to click 'Continually rasterize' so you can scale it without getting a mess of pixels. Note: When pasting keyframes in After Effects they will start from the frame you are on at the moment, so it doesn't matter if the keyframe data in the file starts at some other frame. Many Thanks!.. BTW is this works with ASP 5.6 too? We thought about that some time ago. I contacted a programmer, but he never even started the project. hi. this script is just what i need for my current project. i seem to be having problem pasting the text file into the AE camera. could it be because of my AE version? im using cs3. so far i'v tried selecting the camera layer and control v-ing without any result. can someone please help? did you copy all the text out of the file that's created first? (open the export file and copy all that text first before pasting)... I assume you did but you never know! I have problems with pasting in both After Effects and Photoshop. Restarting the application usually helps. It's really annoying when you copy an image in an external application and Photoshop keeps pasting the previous image from the clipboard while other applications paste the new image. I don't know how that even works. yes i did. do you just select the camera layer and paste or is there a particular text dialogue u bring up and paste into? thanks guys i figured it out. ponysmasher wrote: I have problems with pasting in both After Effects and Photoshop. Restarting the application usually helps. I believe this is happening when your graphics card runs out of memory.